Geeta Kapoor I met soon after I arrived from England, and I got quite interested in her work. She was bubbling with ideas, and she had studied in New York and then she was trying to... and we thought that we need a new generation of art critics. We had older men like Richard Bartholomew and others, but times had changed, you know. And in a way I think a voice in art criticism was... I think it was we were at a point where a voice was to emerge, and one thought that Geeta would be that voice, and in a way she tried to sort of fill in that gap. Well, at that point of time she also was interested in art concerns. Some of us were involved in that, and when she went to Royal College to study, if I am not mistaken it was I who suggested that you go and work with Peter De Francia, and she did. And it was when she went to England and I visited England again that I met Peter for the first time, personally. But she did her dissertation which was called ‘Art and Indigenism’. It was on post-colonial art. So, in some way it comes close to some of the ideas, you know, which we were experimenting with in our own work, and some of the things, you know, which we thought could be written about. So she wrote this chapter in which she included three artists and in which, Husain, Swaminathan and Bhupen are the three artists she discussed in her... which we carried in Vrishchik, and even published as a little booklet. So, that is from ’69 to ’73. This was published in ’73. Well, then she became a much greater associate, and after that we all, you know, began to work together, which culminated in an exhibition called ‘Place for People’. In a way that became what was then known as The Baroda School. Yes, possibly. Baroda School was known already because it had already aroused a kind of a curiosity, and even in a way slight envy right from the time the Baroda artists began to win awards in the National Academy. I know, but frankly Jyoti Bhatt is not really part of that setting. No, there was a Baroda group of artists. I know, but that Baroda group, I mean the people who won the prizes from Baroda are not the same thing as The Baroda School. No, that, well, most people came to know and associate it with after ’70, 70s onwards. And didn’t it have a street realist or something, I mean ‘Place for People’ was an exhibition that was slightly proposing, a new kind of reality? But ‘Place for People’ took place 10 years later. You see? This is something which was in the 70s, you know, and Vrishchik also attracted a lot of attention, and we had both our, you know, friends and critics, you know, some who did not approve of us and... So there was in that sense Baroda also was, you know, in that sense a centre of attraction. You know, people talked about it. I think it was much later in, after 10 years, that the idea of a ‘Place for People’, you know, because we, before that we had an exhibition in ’74, ten artists sort of got together and had an exhibition. It also had several of these. 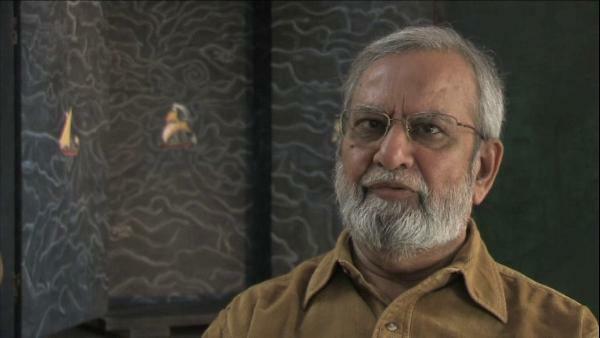 Gulammohammed Sheikh is an Indian painter, writer and art critic who has been a major figure in the Indian art world for half a century. His artistic career is closely associated with the renowned MS University of Baroda in Gujarat where after gaining his Master's degree, Sheikh went on to teach in the Faculty of Fine Arts, and where he was appointed Professor of Painting in 1982.